Premise: The game begins with six contestants competing in the preliminary first round. In the first round, a series of toss-ups questions will be asked. A correct answer earns the contestant the right to play in the next round. The first contestant to answer a question incorrectly or the last contestant remaining — whichever comes first — will be the first to be ejected from the game. In round two, the remaining five contestants will each be asked a question one at a time. A correct answer keeps the contestant safe while an incorrect answer moves their chair backwards. The only way to stop the chair from moving toward the end of the track is by providing a correct answer. With each additional round of questions, the chair speed will increase until it reaches the top speed of 4. Each contestant has a “Panic Button” which can be used to immediately stop their chair if it reaches the Danger Zone area located a few yards away from the end of the track. The Panic Button can only be used once per round and when it is activated, the contestant will be answered an “all-or-nothing” multiple-choice question. A correct answer keeps the contestant safe and moves them toward the Danger Zone start point. An incorrect answer ejects the contestant out of the game. The third round plays the same as the second round, except with four contestants. In the fourth round, the remaining three contestants will be asked a series of toss-up question. The first two contestants buzz-in with the correct answer will be safe while the other contestant will be forced to move until a correct answer is given. 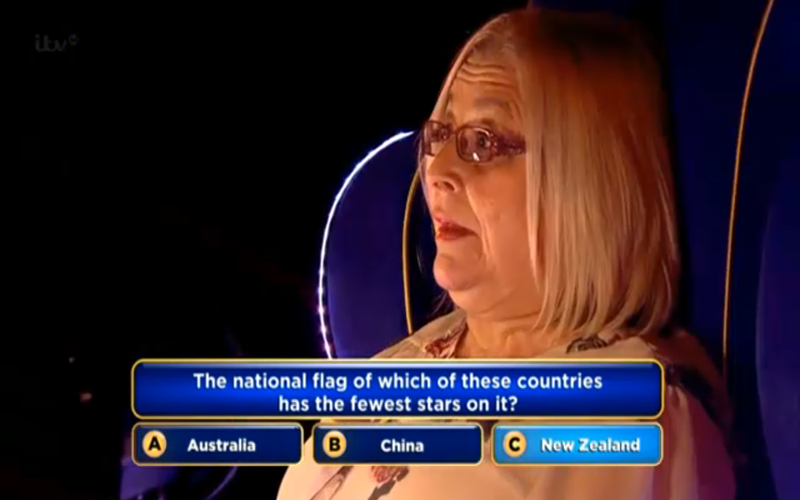 A contestant may also be forced to move by providing an incorrect answer. Like the previous round, the chair speed increases with each additional question round, the each contestant may use their Panic Button once and the round will end once a contestant has been ejected. Round five plays the same as round four, except with two contestants. The surviving contestant will play in the bonus game. In the final end game, the contestant will face up to three 45-second question rounds. Correct answers keeps the contestant safe and incorrect answer moves the contestant’s chair. The Panic Button and Danger Zone are inactive in this round. With each round of questions, the chair speed will increase. The contestant will earn £500 for completing one round, £1,000 for completing two rounds and £10,000 for completing all three rounds. If the contestant hits the end of the track at any time, they will be ejected from the game with the cash they have won up to that point. Since MTV’s Remote Control, we have seen multiple game shows use an array of unique and creative methods of eliminating its contestants from the game such as falling through a trap door in the floor or sliding down a slide filled with slime and gunk leading toward the stage’s exit. Some have successfully utilized the gimmick, like Russian Roulette, and some could have executed it better, like Who’s Still Standing? Like Goldilocks with the Baby Bear’s possessions, Ejector Seat employed this gimmick just right by immediately ejecting the contestant from the game through a blast of steam without giving them a chance to say any “last words”. This is just one of the elements that makes up Ejector Seat’s solid format. For the most part, the show has solid gameplay and is formatted to where quick thinking and natural general knowledge is needed to succeed to answer the array of open-ended questions correctly and blind guessing will not get you far, with the slight exception of keep contestants in the game for a few seconds more should they escape the Danger Zone. The front game rounds are competitive and the trivia questions are challenging and feature a healthy mixture of question difficulty levels from easy “can of corn” questions to ones that require a little more thought. This is a high-pressure, suspenseful game where you will need to keep your cool in order to prosper. 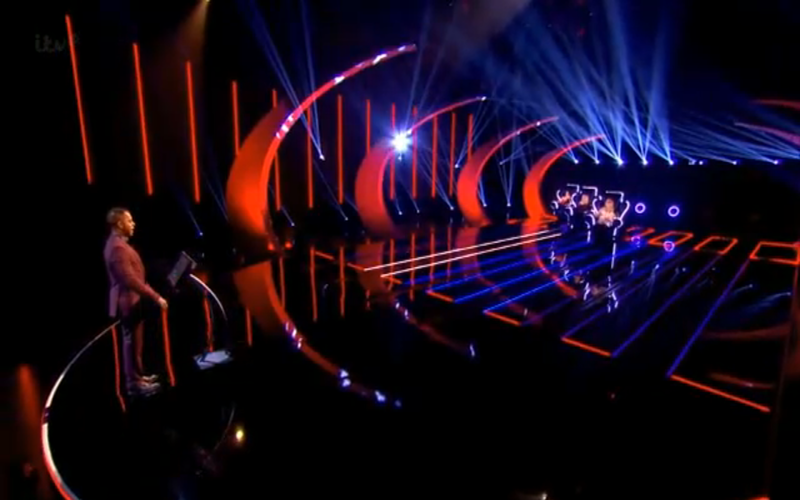 The format’s good variety between rounds makes each episode easy to watch without getting bored. However, considering how rounds two and four are played exactly the same as rounds three and five, respectively, with one less contestant, this show could very well be slimmed down to a half-hour show or 45 minutes at the most. Beside the abrupt ejections, as seen on Russian Roulette, I’ve noticed this show borrowed a few elements from other game shows including the Panic Button, which somewhat functioned the same as a “Long Shot” call on Whew! and the Panic Button on Downfall, and the surviving contestant getting ejected regardless of their performance in the end game, similar to NBC’s Who’s Still Standing? On a quick side note, I don’t necessarily care for the inclusion of the latter element since the name of the game is to avoid ejection from the show. The darkened, simplified design of the set reminds me of the stage design of GSN’s Russian Roulette’s and works well with this show to better conceal the chair’s mechanics as well as the tracks underneath. 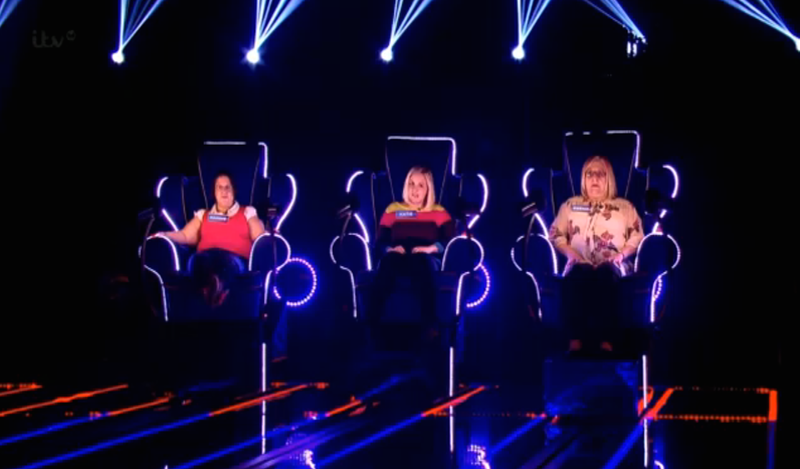 I like how the chairs were created big enough so the contestants are not able to look directly behind them, which gives off a feeling of uncertainty, mystery and danger while moving backwards toward the end of the track. I also applaud the set designers for not going overboard with the use of colorful, neon lights to give the set some life and personality. My only concern, in regards to the set, was the safety of the contestants flipping back in the chair due to the crew running into technical difficulties with the mechanical chairs malfunctioning during the show’s taping sessions earlier this series. To my knowledge, thankfully no injuries had been reported. As host, Andi Peters serves as a good emcee for Ejector Seat with his good-natured humor, calm demeanor and great banter with the contestants. His demeanor and hosting style reminds me of Ben Sheppard’s hosting Tipping Point. The show flow is tolerable for an hour-long show, as I have previously mentioned, the show could be improved by getting rid of the repetitive aforementioned rounds and beginning each game with four contestants instead of six. 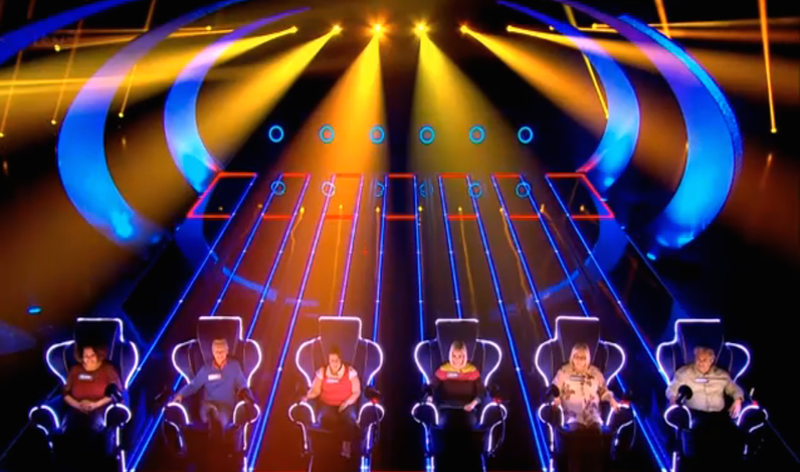 The penultimate head-to-head round could be more intense by the chairs moving automatically when possession switches to the other opponent instead of Peters constantly stopping the action to announce the contestant is “on the move” upon their chair moving. Also, the untimed rounds makes the show hard to watch at times because the gameplay action is not constant like on Jeopardy!. It makes almost each round seem like there’s no end in sight. The only other change I would make to the show is the bonus game. To make the end game more interesting, since no money is at stake in the front game, the final contestant could be awarded £100 for each correct answer in the first round, £200 for each correct answer in the second round and play an “all or nothing” third round for the £10,000 prize. The contestant would also have the opportunity to end the game and keep the money after successfully passing rounds one and two, and leave the show with nothing if they are ejected during a round. Overall, Ejector Seat is a good game show, but it could be better. For U.K. viewers, it’s a good watch to wind down your workday in the afternoons during the week. Will it return for another season? Although it was a tough decision to make, I believe it will survive for another series because it’s fun and engaging to watch. U.K. viewers, check out Ejector Seat weekdays at 4:00pm on ITV! This is a great game show, I liked. I also want to once experience with it.